The yellow number on the right shows how many of your friends are interested in attending that show; the more friends using lolla.me, the higher that number gets! 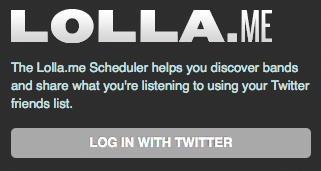 Even if your friends aren't using lolla.me, you can share your schedule with them by pointing them to the URL, http://lolla.me/yourusername. You can also export your schedule in .ics format and import into iCal, Outlook, Google Calendar and elsewhere. Try it out for yourself and get a handle on the festival! Wish I was going myself. Great idea - I hope it works with so many smart phones in one congested area.